What Is Shared Ownership from Aster Group? So what’s Shared Ownership all about then? 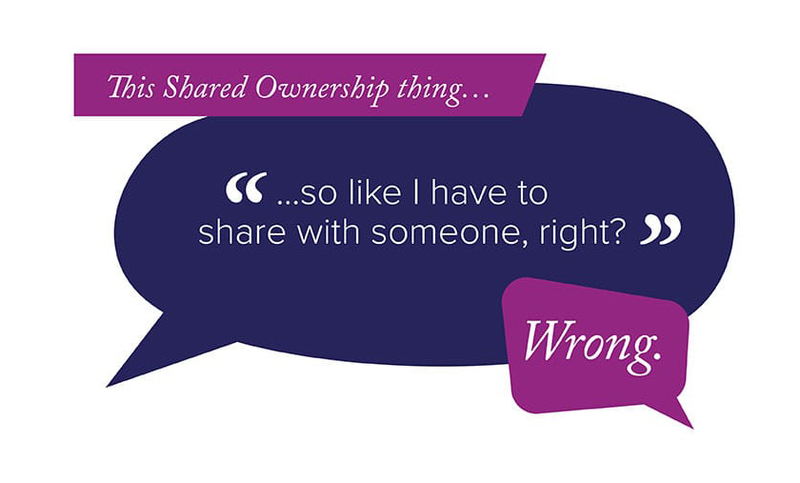 Shared Ownership isn’t about sharing with someone. It’s about getting your foot on the housing ladder. It’s a great alternative to renting and perfect if you can’t afford to buy a house outright. That means not having to raise a massive deposit based on the full property value. Your mortgage and deposit will cover only the % share you purchase. And you pay a low rent to us on the remaining share. Simple. So no, you definitely won’t have to share with anyone. Except maybe your partner, children and the cat. There's plenty of ways to get in touch with our amazing team! We're here on Live Chat, you can also call us 01380 735 480, drop us an email at homeownership@aster.co.uk or even visit Meet The Team to talk directly with any of the awesome sales and marketing team today! You buy a share in a home and pay rent on the share you don't own. That’s Shared Ownership in a nutshell. And the higher the share you buy, the less rent you pay. You can buy anywhere between 25% and 75%, initially. We retain ownership of the share you don't buy and you can generally buy all or some of our share any time after you’ve moved in. A pretty good way of getting off the renting hamster wheel and onto the property ladder, right? If you’ve got sufficient savings, you don’t need a mortgage. You can buy your share outright. Most shares are funded by a mortgage, though, which you arrange with a Bank or Building Society, just like you would a traditional house purchase. Remember though, also just like a traditional house purchase, your home could be at risk if you don’t keep up the repayments. Financial checks will be carried out to ensure you meet the requirements and we always recommend you take individual financial advice too. So, the larger the share you buy, the lower your rent will be. Don’t worry if maths isn’t your thing. We’ll give you details of the rent you pay and your mortgage lender will provide details of the monthly mortgage repayment. Everything’s broken down for you, simply. Oh, and we’ll give you a lease too, entitling you to sell your property or buy more shares, in most cases. The lease also talks about repairs, rent and service charges – these are your responsibility. Take one step closer to your dream home. You can decorate it just how you want, take a look at a few of our properties or take a look at all our developments by clicking here. Choose from any one of our new or re-sale homes and, depending on the house type and location, you can buy a share of it - anywhere between 25% to 75%. If you want to get on the property ladder and you can’t afford to buy or rent a suitable property, Shared Ownership could be spot on for you. It’s a myth that renting is cheaper than Shared Ownership and Shared Ownership gets you on the housing ladder. First though, we need to check that you qualify by doing an assessment. We look at things like your household income, which must be less than £80,000 a year. And we discuss mortgage and lending products and the rates available. Don’t worry, we’ll walk you through everything. Buying a new home is exciting, but it can be confusing, right? That’s where we come in. At Aster, we like making the whole experience enjoyable. You can trust us to be with you every step of the way to answer any questions you may have. In the meantime, here are a few FAQs you may find useful. What if I can't get all the documents together? If you're struggling to get all the documents ready, tell us. Unfortunately, all the documents are essential for getting your application approved. Without them, we might not be able to proceed. What if I only get internet statements? Online statements will only suffice for lenders or Housing Associations if they show your full name and address. That means you’ll need to order copies from your bank or ask for printouts and request that they stamp them. We can use internet statements in the short term but we'll need the originals to get you approved. What if I can't find my payslips/P60? Just ask your employer for copies. Even though we can tell from your bank statements the amount that’s paid in, we'll still need to see your payslips. If your employer can't give you copies then a letter will be required, showing the last three months’ figures, just as a payslip would. If you can't find the answer you're looking for, don’t be a stranger - we’ll be happy to answer any other questions you may have. What if I want to sell a Shared Ownership home I bought through Aster Group? If you're thinking of selling a Shared Ownership home you have bought from us you will need to get in contact with our resales team. You can find out more and fill out our Intention To Sell Form by clicking here. Buy Shared Ownership in Hampshire or Oxfordshire? You're in safe hands with our awesome Oli. Drop him a line on 01380 735 458 or 07795 887 509. Buy Shared Ownership in Cornwall or Devon? Our friendly Jody is here to make your Shared Ownership dream come true. Give her a call on 01380 829 031 or 07825 283 293. Buy Shared Ownership in Somerset or Wiltshire? No one knows more on Shared Ownership in these places than the amazing Matt. Give him a call on 01380 735 545 or 07730 750 786. Buy Shared Ownership in Dorset? Shared Ownership homes in Dorset. We've got you covered by the awesome Nicci. Give her a call on 01929 558 448 or 07795 542 043. We'd love to give you some more information on Shared Ownership and hopefully help you get onto the property ladder too! Complete the form and one of the team will be in touch with you in no time at all.